Call them fried pork dumplings, Chinese dumplings, or even potstickers. Whatever you do, don’t call them difficult to make. 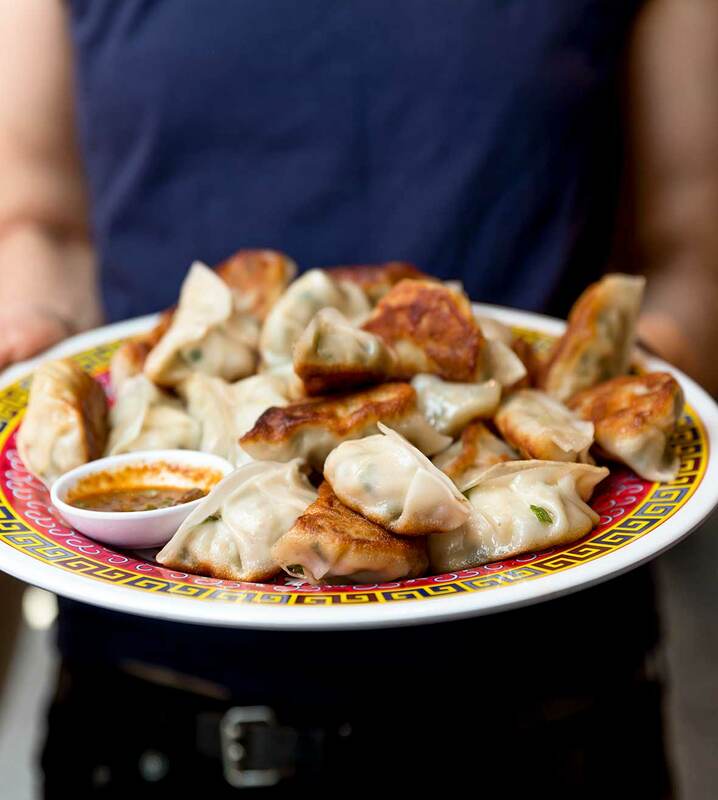 These dumplings are filled with ground pork, napa cabbage, chives, soy sauce, fresh ginger, and sesame oil. They’re fried a just a bit of oil and then steamed. On the side is a piquant dipping sauce. 1. Combine all the ingredients in a blender and blend quickly until combined but not totally smooth. Store in an airtight container in the refrigerator for up to 1 month. Stir well before using. 2. Place the cabbage in a large bowl with the salt. Toss well and set aside for at least 10 minutes. 3. Meanwhile, in a large bowl, combine the ground pork, chives, soy sauce, ginger, and sesame oil and use your hands to mix all the ingredients thoroughly together. 4. Take the cabbage in your hands and squeeze as hard as you can. You will be amazed by the amount of water that comes out. Dump the water from the bowl. Add the drained cabbage to the pork mixture and mix well with your hands until the filling is well combined. 6. To cook the dumplings, heat a large, heavy, flat-bottomed skillet with a lid or a nonstick skillet with a lid over medium-high heat and add 2 tablespoons oil. When the oil starts to shimmer, carefully add as many dumplings as will comfortably fit in the skillet with space between them and turn the heat down to medium. You will need to cook the dumplings in batches. Cook the dumplings, without moving the skillet, until the bottoms are golden brown, about 3 minutes. Check by lifting them up with your fingers and peeking underneath. Carefully add about 2 tablespoons water to the bottom of the pan and immediately cover with the lid. The pan will sizzle and steam up immediately, so don’t be startled. Shake the pan from time to time to keep the dumplings from sticking. Let the dumplings steam for 2 minutes, at which point most of the water will have evaporated. Add another 2 tablespoons water to the pan, cover again, and steam again. Wait till the water has mostly evaporated again and repeat one last time with a final 2 tablespoons water. Turn off the heat, keep covered, and rest for 1 minute. Uncover and turn the heat back to medium-high to crisp up the bottoms. Remove from the pan. 7. Continue to cook the remaining dumplings in the same manner, adding a tablespoon oil to the pan as needed. Serve the dumplings immediately with the black pepper scallion sauce. Prefer not to fry your pork dumplings? No problem. After filling and shaping the dumplings, line a bamboo steamer (or steamer insert) with napa cabbage leaves and place the dumplings on top. Place the steamer in a pot filled with two inches of water, making sure the water doesn’t touch the dumplings. Cover the steamer or pot (if using an insert) and steam for 10 minutes. Fried Pork Dumplings Recipe © 2017 Joanne Chang. Photo © 2017 Kristin Teig. All rights reserved. All recipes and photos used with permission of the publisher. With the new year approaching, I chose to challenge myself to attempt a new skill—making homemade fried pork dumplings. I was a bit intimidated by the idea of folding and pleating, but I can now say with confidence, “Try it. You'll like it!” We did a side-by-side taste test with frozen store-bought dumplings and this recipe easily won out, even if my pleating is that of a novice. My first and worst-looking folded dumplings tasted just as good as the later beautiful ones. Don't miss out on one of the best parts of the recipe—the dipping sauce. It had a nice bite to it and complemented the dumpling nicely. Such a lovely change and upgrade from the basic soy sauce mixture that sometimes comes with frozen potstickers. These fried pork dumplings are little pockets of dumpling heaven! The combination of pork and chive works exceptionally well together and the filling is seasoned perfectly. The dumplings held up well after being frozen in advance, thawed quickly in the fridge, and cooked up exactly as described in the recipe. Not to mention the black pepper and scallion sauce, which is seriously addictive. 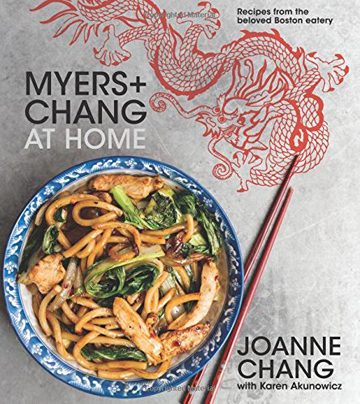 This recipe will always make an appearance any time I'm doing an assortment of Asian dishes. Does anyone have ideas of how to do this gluten free? I’m not well-versed in the world of Asian foodstuffs, so there may even be a different wrapper that I could use. Anyone? Ouida, we don’t have a recipe for gluten-free wrappers, but Andrea Nguyen does, and I trust her. You can find the recipe here. I hope you’ll try our filling, though!! Can I make these a couple of days ahead of time? Could they be frozen? If so do I pre-cook them first or leave them as is and cook on the night I would like to use them? Absolutely, Guy! Just proceed through step 5 in the recipe, and then freeze the dumplings, uncooked, on a baking sheet or tray lined with parchment. When they’re frozen, toss them into a resealable bag and keep frozen until a few hours before you are ready to cook them. You’ll want to thaw them in the refrigerator before proceeding with the recipe. Enjoy!